Christian and the guys at the Artisan shop made our dream kitchen a reality. We are so pleased with the quality, workmanship and color of our new kitchen cabinets. Christian worked with us every step of the way and made sure we were satisfied. He sat down with us and our designs, then answered our questions. All of our requests were met and the kitchen looks just like what we had imagined. The staff was always friendly, kind and personable. We will be sending all our friends their way. 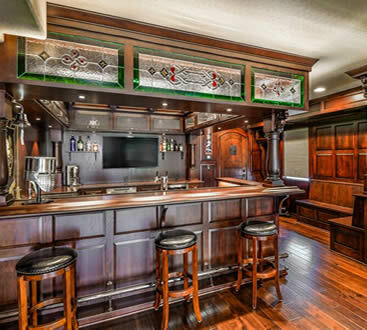 When remodeling our basement after extensive flooding, our general contractor recommended using The Artisan Shop for custom cabinetry. We ended up hiring the company to build the cabinetry for our laundry room, a custom media center, a wet bar, and a custom island. Our design was complicated, but the The Artisan Shop (and Christian in particular) worked tirelessly with myself and my general contractor to make it right. In the end, everything came out exactly as we had hoped! The final look of the entire space is perfect and I would not hesitate to use The Artisan Shop again for my next project. We have recently had the pleasure of working with the Artisan Shop on some beautiful range hood designs for a few of their truly amazing custom kitchens. Without a doubt, this is a team of people who have passion for craftsmanship, design, and a keen eye for detail. Not to mention, they are very professional and easy to work with. We hope to continue working with them and being a part of their gorgeous spaces! Really amazing concepts for the home and kitchen! I loved seeing the showroom, which gives a hands-on experience of what I could select from, rather than looking through a catalog or on the internet. I’d highly recommend the Shop to everyone! Hands down the only cabinet company I would work with! They are courteous, respectful, listened to my ideas but were willing to give their own, but above all produced an amazing product! We built a custom home in 2013 and I spent countless hours in their shop designing and mulling over the plans. I could not have been more happy with the finished product all the way down to the knobs. If you’re at all considering custom cabinets in a remodel or new home, this is the company to work with. I get more compliments on my cabinets than anything else. Fantastic experience every time I work with this company. Turnaround time is great, along with cost, and ease to work with. They have a great selection of materials and skills. Its an easy decision to work with this company. Beautiful cabinets !! Make a kitchen look so fabulous!! And of course the owners are quite personable!! So happy I stopped by! The Artisan Shop exudes professionalism & personalization from its inviting showroom filled with truly impressive custom woodworking, exquisite creativity and incomparable service!